With the recent launch of Google’s much-awaited cloud service, the online storage wars have finally begun. Dropbox, which is the frontrunner in cloud storage and online backup services, has not yet lost its top spot despite the fact that biggies like Apple, Microsoft, and Google are battling against it. Microsoft, which is banking heavily on SkyDrive, is leaving no stones unturned in ensuring that its cloud endeavor doesn't go unnoticed. Google however, is making sure that its ambitious Google Drive project, which people had been waiting for a long time, gets the attention it deserves. These cloud wars have escalated to such heights that even the always belligerent Apple has started rejecting applications that use Dropbox’s SDK. Google Drive, much to everyone’s surprise, is playing it nice and cool and presenting itself in the form of an ‘upgrade’ to Google Docs rather than a separate service. 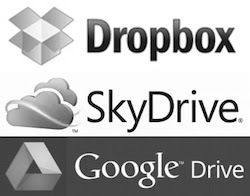 Only time will tell whether Microsoft SkyDrive or Google Drive will achieve the popularity Dropbox achieved; however, if you are having trouble choosing from the list, all you have to do is read this article. We’ll be comparing the three services head-to-head and will ensure that you’ll land up with the one that suits your need. For backup, you can’t really compare these three. All of them do the job really well. Using the native clients, you can save all your important files to the cloud by simply dragging and dropping. File upload is super quick and easy. Other than providing simple backup, they also offer revision control that lets you jump back to the file’s earlier state. Out of these three, I’d have to say the winner would be Dropbox. Not only does Dropbox provide its client on every platform possible, it also makes it dead simple to view revisions of files. This, however, is not as easy to do in Google Drive or Microsoft SkyDrive. Microsoft SkyDrive and Google Drive offers desktop clients for Mac and Windows. Dropbox on the other hand offers applications for Windows, Mac, and Linux. Of course, GDrive has promised a Linux client soon, but Dropbox has been around for a long time. Also, Dropbox’s integration with Ubuntu’s indicator menu and Nautilus is something that makes it one of the best proprietary apps on Linux. Dropbox is the clear winner here. As far as free storage space is concerned, Microsoft’s SkyDrive wins the race. Earlier it was offering a whopping 25 GB worth of free space to its users, but now, that seems to have gone down to 7 GB, which too, to be honest, is not a bad deal. Dropbox offers 2 GB to start with, and Google Drive starts with 5 GB. You can, of course, increase your Dropbox space by inviting other people, but that’s still not going to outmatch Microsoft’s delicious offering. Microsoft SkyDrive: Starts at $10/year for 20 GB. Google Drive: Starts at $30/year for 25 GB. Clearly, Microsoft SkyDrive is the cheapest in the list making it a winner. Dropbox, however, quickly needs to offer more flexible plans for its users, something to compete with Microsoft and Google. As far as the user interfaces are concerned, I’d have to say, Google Drive is still quite messy. The lack of a file-browser-like UI is simply a turn-off. Dropbox on the other hand presents a neat and simple UI, along with native integration file-browser integration. Coming to Microsoft SkyDrive, it too has a great UI, something that many minimalists will like. When it comes to uniqueness or rather the most valuable product of the lot, I’d have to hand it to Google Drive. Despite the tepid response it got from the crowd, it’s integration with other Google services simply cannot be overlooked. While testing out, I noticed that Google Drive fits perfectly in my workflow. I go to drive.google.com, create a new document, and without even closing it I can mail it as an attachment to someone. Also, the ability to integrate different apps into Google Drive is a huge plus. Dropbox on the other hand does offer other unique perks like extra storage space for invites, LAN sync and more, but it doesn't quite match Google Drive’s offering. Google Drive, though nice, is kind of messy. It’s simply neither as good nor as convenient as Dropbox. SkyDrive is good if you’re into Microsoft products, otherwise these two services are not tempting enough to make you quit Dropbox.